Claire Knowles is…*A two-time Best-selling author: “Lights On! Illuminations to Move Your Life Forward” and also “Can You See them No? 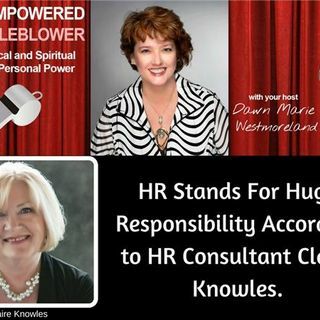 (Elephants in our Midst!” Clair Knowles is a former HR/Labor Relations Manager, having enjoyed a 34-year corporate career primarily untangling people and labor relations problems. She received her Bachelor's degree from the State University of New York, majoring in Business Management and Economics. A Consultant/Entrepreneur, primarily working with ... See More Leaders who lead groups of people in organizations, businesses, work-groups, and work-teams, and who are seeking greater effectiveness and better results. Claire is an in-demand speaker and has appeared on radio/TV/blog-talk as an authority on Leadership. She is associated with the Center for Self-Organizing Leadership and also the Workplace Violence Prevention Institute.